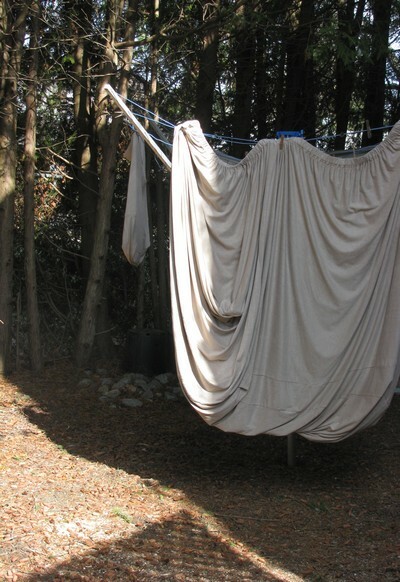 If you, like me, have always thought hanging laundry in winter results in plank-sheets, you, like me, have probably not been leaving them out long enough. Well, seems they were both right. Laundry will dry in below freezing weather as long as the air around it is drier than the laundry itself, as explained here in the Globe and Mail’s ‘Collected Wisdom’. Temperature doesn’t matter; you just have to leave it outside long enough. If you, like me, get a weird thrill from hanging laundry year-round, this will be happy news. If, on the other hand, you hate laundry in all forms, read this, from Geist, and feel better about your placement in the freshly scented, fabric softened, evolutionary conga/laundry line of life. The real drag about hanging out the laundry in the summer – around here anyway – is being eaten alive by mosquitoes. So that would be another plus for sub-zero laundry hanging. One the other hand, nothing beats putting on a pair of toasty warm skivvies fresh out of the dryer in the middle of winter. I love hanging out laundry. Even in the city, clothes and sheets hung on the line smell fresher. Unfortunately–and especially in the city where the space between houses is tighter–birds fly over the clothes line. Birds fly and they let fly. We are a mad species. Bird poop might equal good luck, but I still don’t like hardened bird-poop scrapes when I’m in bed.